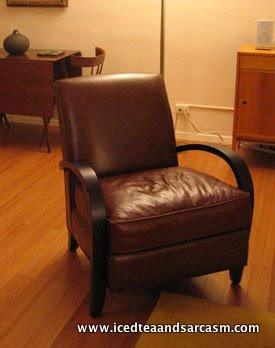 This is the Sloane chair (in leather) from Room & Board. It can also be upholstered with fabric (which might be more comfortable). I really like the lines of this chair, but I worry that the wooden arms will get beat up too easily. Oh... I get it. The arms of the chairs might get beaten up in one of your ragers. Is that what you're concerned about?